Based on Charles Vega’s article from Acoustic Guitar Magazine. Today there is more distinction made between classical and flamenco guitars than was the case in the past, and while most guitarists know that there are differences between the two types, many aren’t aware of what these differences are. Further confusing the issue is that materials and features now considered “traditional” to flamencos were originally used for economic reasons rather than any actual musical purpose. In this article, we’ll explore the sound, history, and construction of the flamenco guitar. A well-made flamenco guitar responds quickly and typically has less sustain than a classical. This is desirable, since the flurry of notes that a good flamenco player can produce would sound very muddy on a guitar with a big, lush, sustaining sound. The flamenco guitar’s sound is often described as percussive; it tends to be brighter, drier and more austere, and have fewer overtones, than that of a classical. As a matter of fact, some jazz and Latin guitarists like this punchy tonality, and some players have even discovered that these guitars’ wide-ranging sound also works well for the contrapuntal voicings of Renaissance and Baroque music. The flamenco guitar is perhaps the most Spanish guitar of them all. In the mid 1800s, Andalusian luthiers made instruments in a wide range of prices, largely based on the materials used and the amount of decoration. The cheapest guitars were often simple, basic instruments made from local woods like cypress, which was much cheaper than imported rosewood or maple; wooden pegs were more affordable than geared tuning machines. Most of the flamenco guitarists in the late 19th and early 20th centuries were Spanish gypsies, who were poor, and who bought the most affordable guitars available at the time. Eventually, instruments with these features came to be called flamenco guitars, but originally there was really no distinction made by makers or players. The flamenco guitar is distinguished from its classical cousin in several ways. 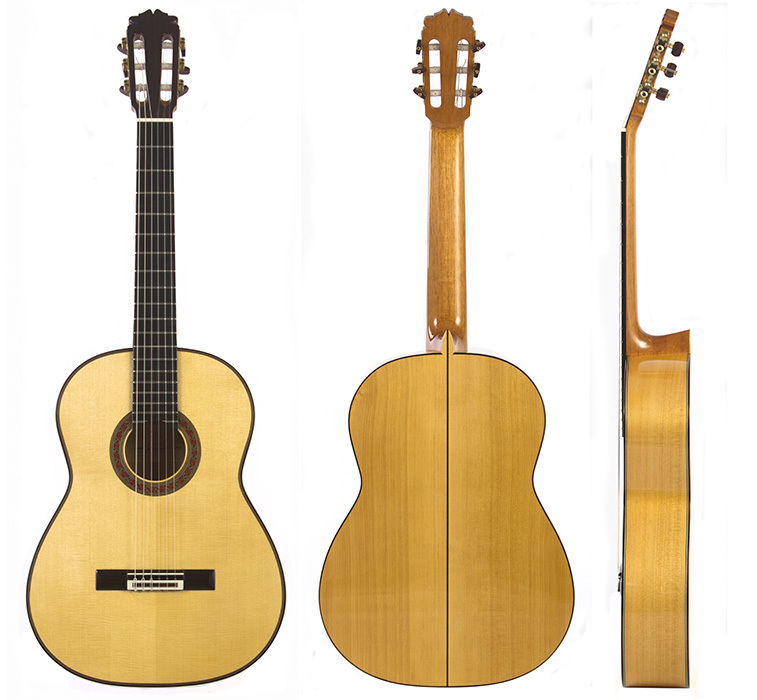 For starters, flamencos are often slightly smaller in body dimensions than classicals. Also, cypress guitars in particular can be extremely light in weight. Because flamenco players need low action and strings that lie closer to the soundboard to facilitate the execution of golpes (the rhythmic right-hand tapping on the guitar’s top that is an essential part of flamenco guitar technique), the instruments are generally constructed with a shallower neck angle and a lower bridge. For the same reason, the top is protected from the player’s fingernails by golpeadores, tapping plates that are usually made of clear plastic (in the past, white plastic or even hard wood was also common).The low action makes some fret buzzing inevitable, especially when played aggressively, but this is tolerated and even desirable in flamenco. Tuning machines are now more popular than wooden pegs. However, pegs still have their advocates, out of respect for tradition and because their lighter weight makes the guitar easier to hold and balance in the traditional playing position (with the lower bout of the guitar resting on the player’s thigh). Cypress is still considered the most typical wood for the back and sides of a flamenco guitar. Mediterranean cypress (Cupressus sempervirens) is a creamy/yellowish-colored wood with a very pungent aroma, which never seems to dissipate completely, even on older instruments. The wood sometimes has distinctively dark grain lines, but is otherwise rather plain in appearance. Because of its stability, cypress can be worked very thin; combined with its light weight, this facilitates the biting flamenco tone. A close cousin to Mediterranean cypress is Monterey cypress (Cupressus macrocarpa), which grows on the West Coast of the US and has many of the same properties. In the early 20th century, some Spanish luthiers used maple and European pear wood for the backs and sides of flamenco guitars. These woods are heavier and denser than cypress, and tend to give the guitar a slightly mellower sound with more sustain. Some contemporary makers continue to use these woods on occasion. For example, renowned Madrid maker Paulino Bernabé has used pear wood for both flamencos and classicals, and J.A. Pantoja Martin of Sevilla frequently uses maple for his flamenco models. Sycamore (often in laminate form) is frequently used for some less expensive, factory-made flamenco guitars, due to the material’s lower cost. While cedar and spruce are used with roughly equal frequency in classical soundboards, spruce tends to be the preferred choice for flamencos, as it produces a clearer, more focused sound. Most flamenco makers use European spruce (Picea abies) because of its relatively light weight and good stiffness (both with and across the grain). However, there are also examples of excellent cedar-topped guitars: The late flamenco star Sabicas played a cedar-topped José Ramírez guitar during the final years of his career. Like their classical cousins, flamenco guitar soundboards are typically braced with a fan pattern; though some modern classical guitars use lattice bracing or double-tops, these developments haven’t made their way to the flamenco guitar. In step with the guitars’ modest origins, the bracing patterns tend to be simple arrangements of five or seven struts, often shaved thinner than on a classical guitar. Another differentiating element (and one that is invisible without special measuring tools) is that the flamenco’s body woods are often worked to thinner dimensions. Particularly with the guitar’s top, this helps create the bright, penetrating sound with very little sustain that many players desire. 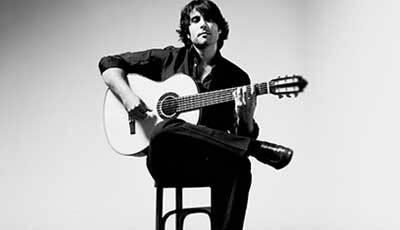 A variant of the traditional flamenco guitar is known as the flamenca negra. These instruments are built with flamenco geometry (including thin woods) but with rosewood back and sides. These guitars are popular with soloists (as opposed to those who play in a flamenco ensemble that includes singers and another guitarist) and offer a sound that is, not surprisingly, in between that of the traditional cypress flamenco and the classical guitar. Madrid luthier Arcángel Fernández is often credited with building the first flamenca negra around 1959, and players such as Paco de Lucía have popularized the style. If you’re new to nylon-string guitar and haven’t tried a flamenco, you owe it to yourself to check one out, as you may be surprised by its inimitable voice. If you’re a serious aficionado of the style, you’ll be glad to know you now have more choices in instruments than ever before, with great makers hailing from all over the globe. ¡Olé! As with classical guitars, a top-quality flamenco guitar from an established maker is not inexpensive and may require a long wait. While a number of non-Spanish luthiers have made their mark in the classical world, the best flamenco guitars have traditionally come from the workshops of Spanish makers, though there are, of course, exceptions. The legendary Antonio de Torres (1817–1892) made some simple, cypress-bodied guitars that were obviously intended for players without fat pocketbooks and thus found their way into the hands of flamenco players. José Ramírez I (1858–1923), the founder of the firm that still bears his name three generations later (now under the leadership of Amalia Ramírez), made his reputation by building good-quality utilitarian guitars for working flamenco musicians and casual players. He taught the craft to his younger brother Manuel (1864–1916), and Manuel in turn trained other makers, like Santos Hernandez (1873–1943) and Domingo Esteso (1882–1937). Hernandez and Esteso are often said to have defined the modern flamenco guitar. Marcelo Barbero (1904–1956) is another maker of the same rank. Most contemporary Spanish luthiers build both classical and flamenco guitars, though there are some—like the Conde family in Madrid, Manuel Reyes in Cordóba, and Andres Dominguez Guerrero in Sevilla—who specialize in flamencos. Outside of Spain, American luthiers Lester DeVoe, Aaron Green, and Tom Blackshear build flamenco guitars that are highly regarded. While most professional players will choose a custom-made instrument, there are some spanish guitar factories that make models available at modest prices. Most Spanish manufacturers, including Alhambra, Camps, Esteve, Paco Castillo and Raimundo, all produce very good flamenco guitars with high standards of quality. Posted in Acoustic Guitars, Classical guitars, Flamenco guitars and tagged alhambra guitars, buy flamenco guitar, classical guitar, flamenco guitar, flamenco guitar differences, flamenco guitar price, Guitar, spanish guitar, Stringed, what is a flamenco guitar. Bookmark the permalink.